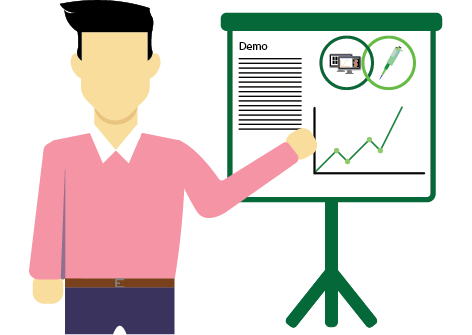 Here we show how we brought individual lab projects together and how we implemented them in our device! We performed experiments in which we show that our cells are still viable after drying (which means that they can be safely shipped and still work properly), and that we can measure fluorescence in blood serum. 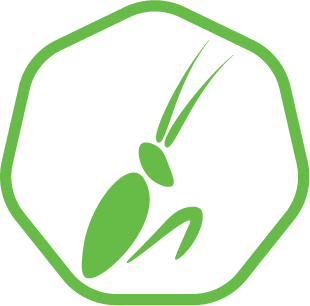 We combined the "Specific Visualization" and "Fluorescent Protein" modules, by which we aimed to optimize the fluorescent signaling system of Mantis. Furthermore we combined the "Signal Transduction" and "Specific Visualization" modules to directly measure antigens by coupling the affinity molecule, Cpx signal transduction and Bimolecular Fluorescence Complementation (BiFC) specific visualization. In order to ship our bacterial system to the local healthcare center (and to be used in the field later) we need to dry the cells in order to be able to ship them safely and keep them viable. The first experiment consisted of making an overnight culture of Escherichia coli DH5α. Different amounts of kaolin clay (Merck)  were added to 2 mL of this culture (in duplo) and left to dry overnight in a laminar flow cabinet on a Petri dish. The next day the cell/clay mixture was scraped off the Petri dish and resuspended in 1 ml of SOC medium. Of this suspension, 100 µl was put on LB agar plates and left to incubate overnight at 37ºC. The next day, the number of colonies were counted and compared to the control, to which no kaolin clay was added. This experiment was repeated under identical conditions, but the drying period was extended to two weeks. In Figure 1, the number of colonies normalized with regards to the control sample is given on the Y-axis. A clear difference in the survival rate of the bacteria that were revived after 1 day when compared to the rest can be observed. The sample to which 0.1 grams of clay was added to the cell culture has a significantly higher survival rate compared to the control sample. 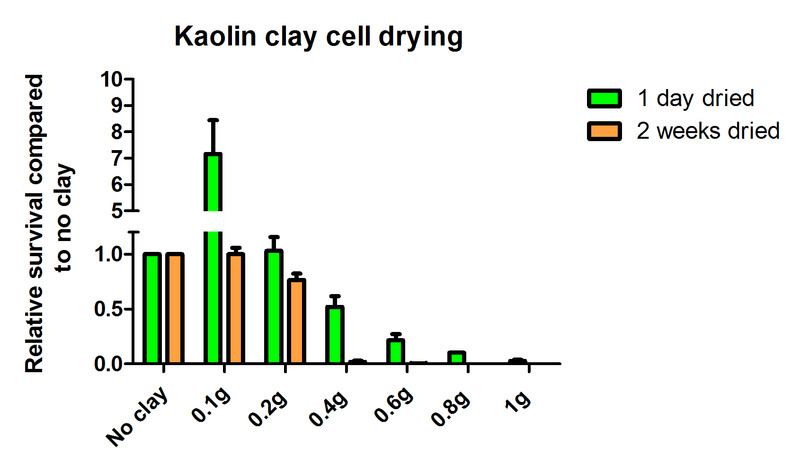 This result gives an indication that drying cells in a kaolin clay matrix is an improvement over drying cells without a clay matrix. However, when samples were kept dry for 2 weeks at room temperature there seems to be no significant difference in the survival rate compared to the control sample. 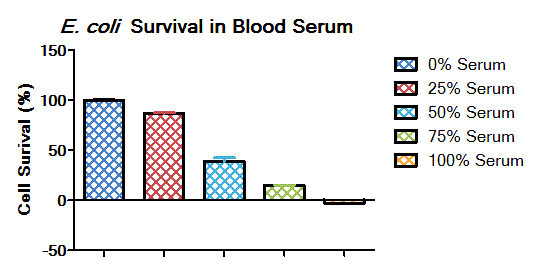 Figure 1: Relative survival rates of E. coli dried in a clay matrix as opposed drying without cell matrix. Next up, we need to know if our cells can survive and function properly when we add a blood sample to measure antigens. We took several steps to investigate this. First, we analyzed if E. coli could grow in (dilutions of) horse blood serum. To do this, we grew cultures with several ratios of Lysogeny Broth (LB) to horse blood serum overnight. The results can be found in Figure 2. Figure 2: E. coli is grown in LB with added horse blood serum in different ratios. Cells were grown overnight in 2 mL cultures and the optical density at 600 nm was measured after 18 hours. Culture growth relative to the 0% blood serum sample (%) is plotted. We show that E. coli is able to grow in horse blood serum concentrations up to 75%. This means that our cells would be viable when a small amount of growth medium is added before measuring, which prevents a high dilution of the antigen and, subsequently, a lower fluorescent signal. In addition, we tested if fluorescence can be measured in blood. We grew E. coli K12 containing eYFP under control of the araC/pBAD promoter overnight in LB. These cells were centrifuged and resuspended in 1 mL of LB with added horse blood serum (the same dilutions were used as in the viability test above) and YFP was matured at 30 °C. Fluorescence was measured after six hours. Figure 3: eYFP fluorescence measured in E. coli resuspended in several LB to horse blood serum ratios. eYFP was excited at 512 nm and measured at 528 nm. Measurements taken after 6 hours. Here we show that fluorescence can be measured in all blood serum dilutions, whereas the negative controls containing no eYFP show negligible fluorescence. 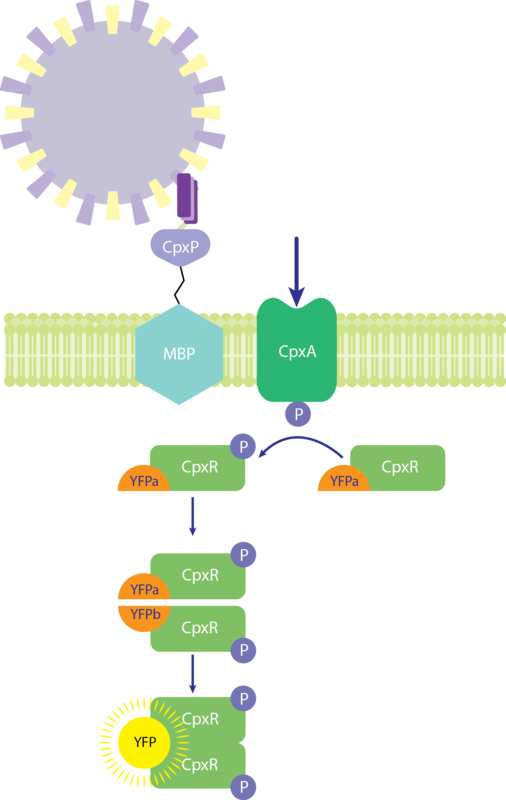 Figure 4: eYFPn and eYFPc are fused (seperately) to CpxR. This way BiFC is used to visualize the CpxR dimerization step. .
We visualize antigen binding using the Cpx pathway by fusing split fluorophores to interacting proteins. Through a combination of wet- and dry-lab work, we found that a system based on CpxR dimerization yields the best results using Bimolecular Fluorescence Complementation (BiFC) (Figure 4). We used eYFP, split after amino acid 154, as the reporter. This is a commonly used fluorescent reporter in BiFC . We aim to improve this reporter, both in signal intensity and response time. During our "Fluorescent Protein" project we tested a number of fluorescent proteins, of which mVenus showed the shortest maturation time. Furthermore mVenus is designed to have a fast and efficient maturation time , exactly what we need! Also, our Cpx pathway model showed that several interactions of the Cpx pathway visualization can be improved, of which using a fluorescent protein with a decreased maturation time was the most feasible to attempt in a laboratory setting. We fused mVenus-termini to the C-terminus of CpxR in the same fashion as we did with eYFP and transformed this to E. coli K12. Experiments with mVenus were performed using the same protocol with optimal induction and activation parameters used during experiments with eYFP, and can be found here. Figure 5: CpxR dimerization visualized using eYFP (left) and mVenus (right), with a L-arabinose concentration of 0.2% (w/v) and different activator (KCl) concentrations over time. The results show that usage of mVenus over eYFP as a reporter protein increases the produced fluorescent signal more then five times. Unfortunately, the background signal also increases a lot, which means we lose specificity of our response. We hypothesize that the maturation rate of mVenus is too high, which means that many non-specific interactions become irreversible, leading to high fluorescent signals even when no activator is present. This means that mVenus is not a suitable candidate to visualize antigen binding within our diagnostic. During this project, more reporter proteins were tested. Unfortunately we didn’t have time to test these in the CpxR dimerization setup. At this moment, we recommend testing sfGFP as a reporter for antigen binding. We found that sfGFP is thermostable, i.e. it matures efficiently at high temperatures, while still being one of the fastest and brightest reporters we tested. You can see the results of these experiments here. Figure 6: Schematic of direct visualization of antigens. When an antigen is present, it is bound by the affibody-CpxP fusion and titrates away from transmembrane protein CpxA. CpxA is subsequently activated and autophosphorylates. This phosphoryl group is transferred to response regulator CpxR. 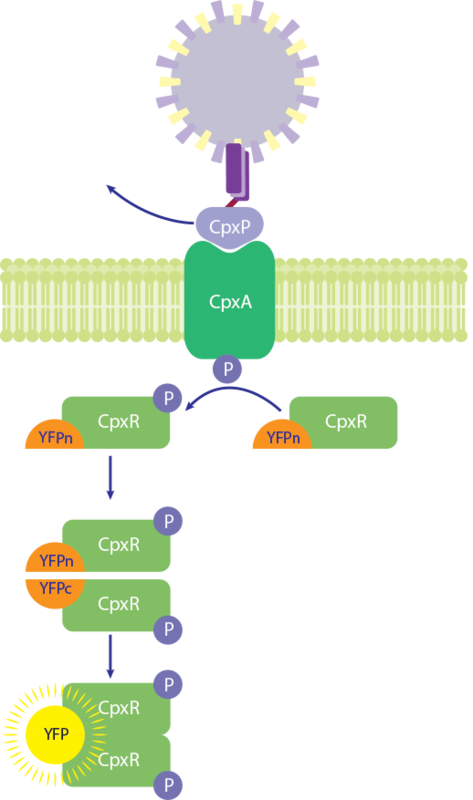 Phosphorylated CpxR can subsequently homodimerize, this protein-protein interaction is visualized by fusing split eYFP-termini to the CpxR-C-terminus. Once CpxR homodimerizes, eYFP reassembles and its fluorescence is restored. Here we test the direct coupling of the projects “Signal Transduction” and “Specific Visualization”, where we express the whole detection system in one cell, from affinity body to BiFC (Figure 6). While we induced Cpx activation by addition of KCl in the Specific Visualization project (to mimic antigen presence), here we actually measure antigen binding. A functional affinity body against rabbit IgG  was fused to the N-terminus of Cpx inhibitor CpxP (which resides in the periplasm ). To determine if IgG can induce the Cpx pathway (BBa_K2387025), the outer membrane of E. coli has to be removed, as IgG cannot penetrate the outer membrane . This is done through a method called spheroplasting. To prevent CpxP from freely titrating away from the membrane it is tethered to the inner membrane by fusion to a transmembrane Maltose-Binding Protein (MBP) mutant . This fusion was placed under control of the IPTG inducible tac promoter (BBa_K864400). To rapidly translate the generated signal upon IgG binding, Cpx pathway activation is visualized using BiFC. Split eYFP is used as a reporter, and its N- and C-termini are fused to the C-terminus of response regulator CpxR (BBa_K2387032). These fusions were placed under control of the L-arabinose inducible pBad/araC promoter(BBa_BI0500) . Upon dimerization of CpxR, as a result of the Cpx system activation, the two eYPF halves are combined, leading to yellow fluorescence. To combine these systems (Figure 6), E. coli K12ΔCpxP was cotransformed with these systems. BBa_K2387025 was placed in medium copy number plasmid pSB3T5 to enable this. Cells were grown following the spheroplasting protocol. Cells were induced with 0.2% L-arabinose and 0.05 - 0.2 mM IPTG before growing them at 37 °C; the Cpx system was activated by addition of 0.1 mg IgG at timepoint 0 min. As a control, non-spheroplasted cells were used; we assume IgG cannot penetrate the outer membrane . Fluorescence was measured at 27 °C. spheroplasts are expected to remain for five generation before fully regenerating their outer membrane . Figure 7: Fluorescence/OD600 values measured over time. Native E. coli K12ΔCpxP (JW5558(-)) were used as negative controls for both spheroplasted (Sp.) and non-spheroplasted (non-Sp.) cultures. E. coli K12ΔCpxP containing CpxP-Affibody-MBP fusion (BBa_K2387025) and CpxR-eYFPn-CpxR-eYFPc fusions (BBa_K2387032)(CpxR-Ab) were induced with 0.2% L-arabinose (L-ara) and 0.05 - 0.2 mM IPTG. 0.1 mg IgG was added at time-point 0. Spheroplasted and non-spheroplasted cells were induced and activated equally. In Figure 7 it is visible that a fluorescent signal is generated after addition of IgG. In both the spheroplasted and non-spheroplasted cells an increase in fluorescence is visible within the first 100 minutes, after which the signal decreases and stabilizes. For both the spheroplasted and non-spheroplasted cells the measured fluorescent signals are much higher than in their negative controls. We cannot draw any thorough conclusions. Due to time constraints we were unfortunately unable to repeat the experiment. However, it seems likely that presence of IgG is linked to an increase in fluorescent signaling, but as we also see this signal increase in the non-spheroplasted cells it is also possible that we observe a non-specific activation of Cpx. Further research is definitely needed before conclusions can be drawn from this experiment. Zohar-Perez, C., Chernin, L., Chet, I., & Nussinovitch, A. (2003). Structure of Dried Cellular Alginate Matrix Containing Fillers Provides Extra Protection for Microorganisms against UVC Radiation. Radiation Research Society, 160(2), 198–204. T. Kerppola, “Bimolecular fluorescence complementation (BiFC) analysis as a probe of protein interactions in living cells,” Annu. Rev. Biophys., vol. 37, pp. 465–87, 2008. Nilsson, Björn, et al. "A synthetic IgG-binding domain based on staphylococcal protein A." Protein Engineering, Design and Selection 1.2 (1987): 107-113. Raivio, Tracy L., et al. "Tethering of CpxP to the inner membrane prevents spheroplast induction of the Cpx envelope stress response." Molecular microbiology 37.5 (2000): 1186-1197. Muller, S., Zhao, Y., Brown, T. L., & Morgan, A. C. (2005). TransMabs: cell-penetrating antibodies , the next generation. Expert Opinion on Biological Therapy, 5(2), 237–241. Fikes, John D., and P. J. Bassford. "Export of unprocessed precursor maltose-binding protein to the periplasm of Escherichia coli cells." Journal of bacteriology 169.6 (1987): 2352-2359. Ranjit, D. K., & Young, K. D. (2013). The Rcs Stress Response and Accessory Envelope Proteins Are Required for De Novo Generation of Cell Shape in Escherichia coli. Journal of Bacteriology, 195(11), 2452–2462.